1981 - 1989 Unopened Eddie Murray Rack Rak Pack Collection - Free Shipping! 1993 Bowman Jumbo Pack Sealed Wax Box - Possible PSA 10 Jeter? Free Shipping! 2005 Topps All Time Yogi Berra Fan Favorites Refractor PSA 10 Pop 4! 2006 UD Run Producers #RP-8 Derek Jeter PSA 10 Gem Mint! 1993 Fleer Atlantic 10 Packs - All with Cal Ripken Showing on Back. PSA 10s? 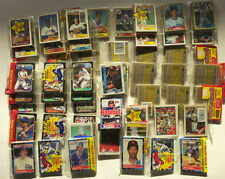 (27 packs) 1979 -1990 HUGE Mets Rack and Cello Lot - 86 World Champs - Read! Large lot of 75 - 1978 Topps Baseball Checklists Unmarked - Free Shipping! 1991 PSA 10 Rookie Lot Jeff Bagwell 19 card Stadium, Studio auto, Low Pops READ! Sosa and Bonds - Game Used Rookie Graded Lot - 8 cards Graded Gem 10 & 9 - Look!